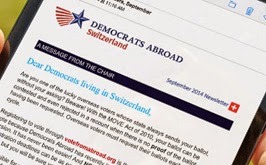 Democrats Abroad members were given a special treat in Geneva on Friday, February 12th. Governor Tim Kaine, Chairman of the Democratic National Committee, was in town and addressed a group of more than 80 DACH members at a free event hosted by Anne-Shelton Aaron at her beautiful home. Governor Kaine finished his first European tour as DNC Chair, visiting London and Moscow before coming to Geneva. The Governor was welcomed by DACH executive committee members and International Democrats Abroad chair Christine Schon-Marques. In his remarks, Governor Kaine covered a variety of topics including the recent special election in Massachusetts, the Supreme Court decision on campaign finance, and the Democratic plan for the 2010 midterm elections. Afterwards, Governor Kaine took several questions from the audience, posed with members for photos and answered more questions before leaving to attend a fundraising dinner elsewhere in Geneva. To close the evening, Democrats Abroad Vice Chair, Michael Copping presented the Governor with a box of chocolates from famous Geneva chocolatier Auer. For more photos from the event, visit our Flickr page.